The Department for Communities and Local Government were yesterday given 28 days notice to vacate their central London premises amid mounting criticism of their recent behaviour. Travellers, Gypsies, Roma and supporters behind the move cited “persistent racially aggravated persecution… harassment, alarm, and distress amounting to anti-social behaviour and gross misconduct”. The government department, led by Conservative Eric Pickles, and responsible for much-criticised changes to Traveller site provision in the recent Localism Act, refused to comment last night. Those serving the notice insisted they had completed a full ‘Equalities Impact Assessment’ that had “balanced the needs of Eric Pickles’ political career against the rights of travelling communities to a home”. Pickles’ department have been given 28 days to vacate the premises, with those behind the notice insisting that if this is not observed, “direct action will commence no later than 1pm on the 19th October”. 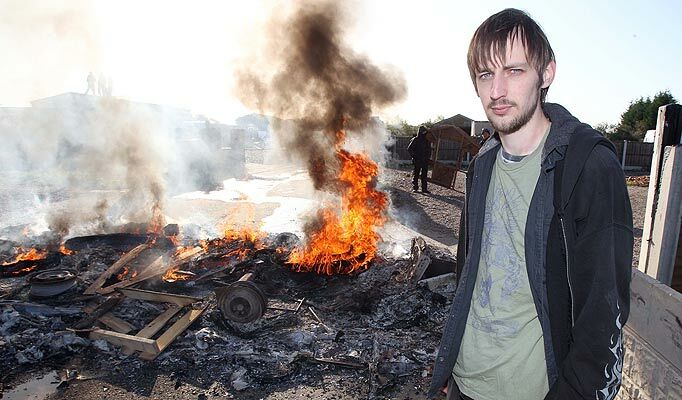 Speculation over the significance of the date has filled the department, with many pointing to the first anniversary of the Dale Farm eviction as a primary reason. A video was leaked last night of the notice being served and can be viewed below. We’re launching the ‘Fight for Sites’ campaign this autumn: a confrontational and much-needed challenge to local and national Government, bailiff companies and the Media, who together construct a cycle of homelessness, evictions and racism. On September 20th we’ll be having a public meeting, on October 19th a Mass Action to coincide with the first anniversary of the Dale Farm eviction. Click on the links below to find out more. We also have an ‘Action Pack’ for all those interested in the issues and those who want to know more about the campaign. way after we explained what we were doing and showed them the information on display. the testing by the Environment Agency. treatment of the Traveller families that they marched over to sign it without the need for an invitation. and M&S – you’ll see our flags! Do try to join us – and bring some music if you can! The Environment Agency is expected shortly to take soil samples at Dale Farm, where last October 80 families were evicted under planning regulations by hundreds of police and bailiffs. If, as residents and campaigners expect, hydrocarbon and asbestos contamination is found, the £8 million already spent on the eviction is likely to rise . 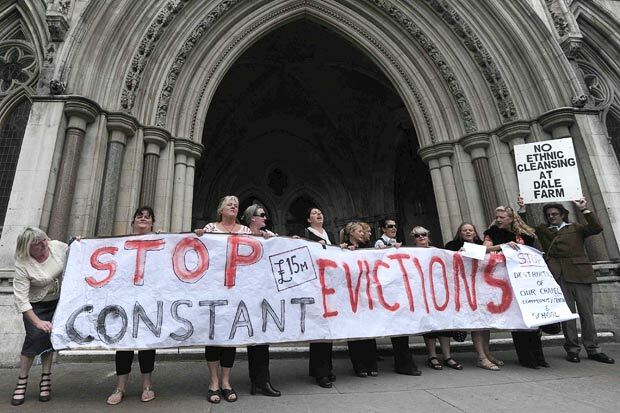 The news comes as Basildon Council last week began further legal proceedings against the evicted families who claim they have ‘nowhere else to go’. Those living on the private road leading up to their former homes in Crays Hill, Essex were served enforcement notices giving them until the end of August to leave . The Council had previously committed to the removal of all polluted material from the site in the High Court and received funding from the Department of Communities and Local Government for the task as part of their multimillion pound clearance last October. Since then council contactors have bunded* the land, exposing thousands of tons of subsoil – a temporary measure, the council claims, to prevent families from returning to their properties. Inspectors from the Environment Agency will now determine whether in doing so the council has created a serious health hazard in digging up the land, not only for families on the road but for adjacent homes, including over fifty authorized Dale Farm properties. Parts of the Dale Farm estate have in the past been used by Basildon council for the storage of abandoned vehicles, as well as landfill. Over 6,000 cars were scrapped at the site before it was sold over a decade ago to families . Local campaigners have made complaints to the Environment Agency that by breaking up extensive hard-standing, the council have themselves caused massive pollution. Grattan Puxon, longtime Dale Farm supporter and friend of the evicted families said “the council have no leg to stand on. They’ve evicted families from their homes on the principle that the land was greenbelt, and yet they’ve now spent millions polluting the land after the eviction. Meanwhile the families that used to live here are still homeless and have nowhere else to go and yet the council seem intent of driving them out of Basildon”. * Bunding is the process by which flat land is turned into embankments and trenches. Developers regularly do this to make land uninhabitable. The Press Complaints Commission (PCC) have today ruled against the complaint of Dale Farm Solidarity against the News Corp newspaper ‘the Sun’. For two months in September and October 2011, journalists from the Sun went undercover at Dale Farm, posing as legal observers. “Legal observing is vital in protecting the right to protest and holding the police to account for their actions. It also provides valuable and reliable information in the event of criminal charges and lawsuits. By posing undercover as legal observers for two months, the Sun effectively sabotaged the work of legal monitors at Dale Farm, and put into jeopardy future legal monitoring programmes throughout the UK. Remarkably, in today’s ruling, the Press Complaints Commission has condoned such destructive acts. It will be now be impossible for organisations that use legal observers to know whether their observers are actually doing their job, or are instead undercover reporters. This was the core of our complaint, and yet amazingly, in their ruling, the Press Complaints Commission did not even question whether it was necessary for Sun reporters to pose as legal observers. For further comment, call 07729762059. Documents available upon request. International concern has been widespread, with the UN and Amnesty International both condemning the original eviction. Last week, as part of ‘Roma Nation Day’, a global day of protest against discrimination towards Gypsy, Traveller and Roma communities, Roma activists in Romania held up flags declaring ‘We Support Dale Farm’ [see photo]. 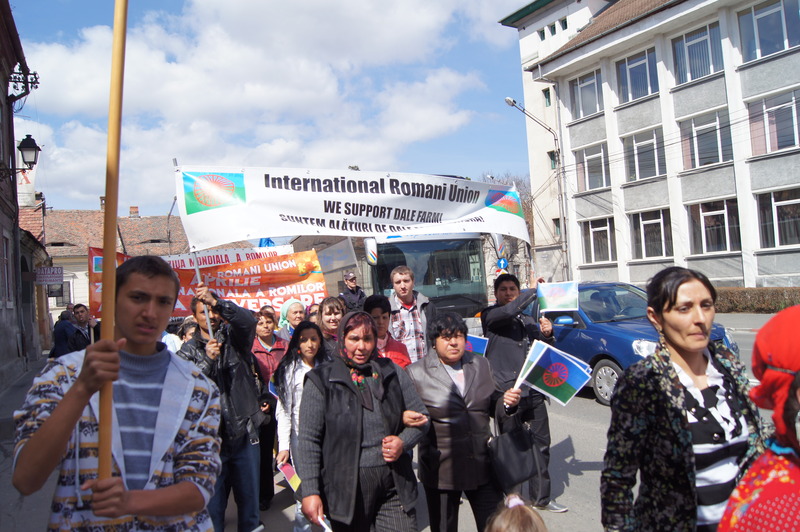 Roma Activists in Romania hold a banner saying 'We Support Dale Farm' as part of Roma Nation Day. Although Tony Ball did not win the ‘Council Leader of the Year’ award, the protesters were determined to present the Basildon Council Leader with an alternative award for ‘Community Wrecker of the Year’.